Have you been looking for a fun and simple way to keep people engaged and having fun, and even motivate them to share your site with their friends and family? I think a quiz does just that! 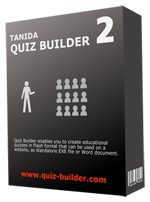 Quiz Builder is a simple software, starting at just $49, that allows you to create custom flash quizzes that you can place on your website and blog. It’s a one-time price, unless you want to sign up a year later for support, and is a fun way for you to gather data around a specific topic or event. Hop over to the site, review the samples, and let me know what you think? OK? I’m planning to add one of their quizzes to my own site, and can’t wait to see the results.